Designed specifically to fit the any thread pattern to simulate HK G28 Style Weapons Platform / HK DMR. NOTE: This muzzle device does NOT comply with the strict definition of the new 2017 / 2018 "California Muzzle Brake". The new definition requires all flash to be diverted up into the view of the shooter. This item does NOT do that. This page is ONLY for the FLASH ENHANCER / MUZZLE BRAKE / BARREL EXTENSION seen as "A" in the photo above. All other photos are for reference only. Let's talk briefly about Flash Suppressors vs. Muzzle Brakes and Flash Enhancers. I cover this in greater detail below, but this point needs to be addressed at the very beginning. The Very Definition of a "Flash Suppressor" means that some "FLASH" is suppressed. 90% of all "quote" commonly referred to as "Flash Suppressor" actually do not suppress any flash. Muzzle Brakes in general also do little or no flash suppression, but rather re-direct the flash. We can NOT call our G28 Muzzle Device a "Flash Suppressor" or a "Muzzle Brake" given the definitions quoted by the Ca. DOJ or the Flow Chart found on the CALGUNS.NET web site as neither is applicable. While our G28 Muzzle Device may look at first glance to an uneducated person like the "Evil" Flash Suppressor so feared by the Anti-Gun Idiots, it is in fact a "FLASH ENHANCER". As we clearly state below our through hole is not limiting nor do the slots reduce the flash in any manner. 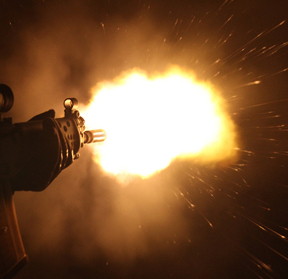 When photographed at night the muzzle flash from one of our G28s appears to actually increase the size of the flash. Increasing the size of the muzzle flash from what would be that from no device attached to the barrel is a physical impossibility. It is instead more noticeable as the pattern of the flash is increased in surface area making it appear to be larger than without any device in place. Here is a photo of the MFI G28 Flash Enhancer in action. Here is a photo taken at this past Knob Creek's night shoot. Does this look to you like a "Flash Suppressor"? NOTE: Even though the overall length of this is 3.875" part of that is the threads. As you can only count the threaded area once (threads of the item cover the threads on the barrel) the total ADDED LENGTH to any weapons system's barrel would be about 3.25". This item is designed to emulate the new HK G-28 Flash Suppressor found on the Designated Marksman Rifle. Clearly this design is nothing new and is basically a direct copy of the FN Model 30 Sniper Rifle Flash Suppressor. We received so many requests for this style muzzle brake / flash suppressor for the HK MR556 and HK MR762 that we had to help out our loyal customers. This same item looks great on so many other weapons as well. We also make a longer version for the USA Steyr AUG to get it to the CA DOJ 30" overall length. Both of these items are in VERY LIMITED PRODUCTION while we see what the market demand is. So unfortunately they are not as cheap as other muzzle brakes that we manufacture in huge quantities. We appreciate your input and suggestions for new products. We are proud to be able to assist our customers from time to time in achieving their final goal. Heat Treated to about Rockwell 28. Threaded 1/2 X 28 tpi. Mil. Spec. for any AR15 in .223. Crush / Peel Washer NOT required. Weapons Grade Steel / Mil. Spec. Black Oxide. Cost Effective: Highest Quality at the lowest price is always our goal. We achieve this by making these in high volume. This equates to greater profits for distributors and re-sellers. Nothing else on the market compares in versatility, quality and cost effectiveness. Muzzle Brakes are also known as: Flash Suppressor, Flash Hider, Flash Hinder & Anti Climb Device. This however we classify as a FLASH ENHANCER. We test all our Flash Enhancers to be 100% sure that they function shot after shot without any problems. MFI uses the term "Flash Suppressor" ONLY in reference to the shape / look that our Muzzle Device / Flash Enhancer has as they are designed to mimic the external appearance of their Military Counterparts. The fact is that all our Flash Enhancers have ZERO Flash Suppression and little if any Anti-Climb effects during shooting. This is because we bore out the forward section with a straight through hole. NOTE: DeGroat Flash Enhancer like the MFI G28 Flash Enhancers does NOT actually increase the muzzle flash. The difference is and why the DeGroat appears to be so much more noticeable is that the vents are pointed backwards towards the shooter. We do not do this as the DeGroat while entertaining as it is... really blinds you and it vents gas back onto the shooter's face instead of off to the side like the MFI G28 is designed to do. NOTE CALGUNS Flow Chart Definition: BATFE recognizes this product and 99% of all muzzle devices as "Muzzle Brakes" or "Muzzle Devices" as they do NOT meet the 1989 or 1993 crime bills definition of a Flash Suppressor given how little most muzzle devices actually reduce flash. Ca. DOJ has never ruled on any of the "Compliant Parts" meaning never on the "Bullet Button" or any other accessory. There is a definition that is found on the CALGUNs flow chart which is what CALGUNs believes is the interpretation of the Ca. DOJ in regards to a Muzzle Brake vs. a Flash Suppressor. BATFE ruled that in order for a muzzle device to be a "Flash Suppressor" it had to suppress at least 65% of the flash. BATF found through testing that the ONLY devices that actually met this criteria were open pronged muzzle devices like the early Colt AR15 SP-1 3 Prong Flash Hider and the SIG 552 3 Pronged Flash Suppressors. In fact both of these nearly negate all of the flash, where as all other Bird Cage Style devices (including this one) did not meet that criteria of suppression. Thus BATFE views this item as anything but a "Flash Suppressor". The CALGUNs definition is clear that in order to be a Muzzle Brake in CA the exit hole must reduce in size, which ours does NOT. That being said our product does NOT suppress any flash and in fact through our testing and above photograph clearly demonstrates "FLASH ENHANCMENT" and NOT "Flash Suppression". So if you are looking at doing a "Featureless Rifle" using a G28 Flash Enhancer should be in compliance. The MFI Barrel Extension / Muzzle Brake / Flash Enhancer does NOT reduce muzzle noise or muzzle flash in any way. So these are 100% legal for the regular civilian to own in all 50 US States.